Join us for the MPAC AGM and the final MPAC meeting this Thursday, May 26 at 7:00pm in the Library. Our new MPAC Executive Team members will be elected this Thursday! Staff Appreciation Lunch - Thank you! MPAC thanks all those who volunteered to make this a very special day for our wonderful Staff. Special thanks to Maura who put her heart and soul into coordinating this event every year. Register by Monday, May 23: Hightouch Hightech - After School Fridays for K-7. 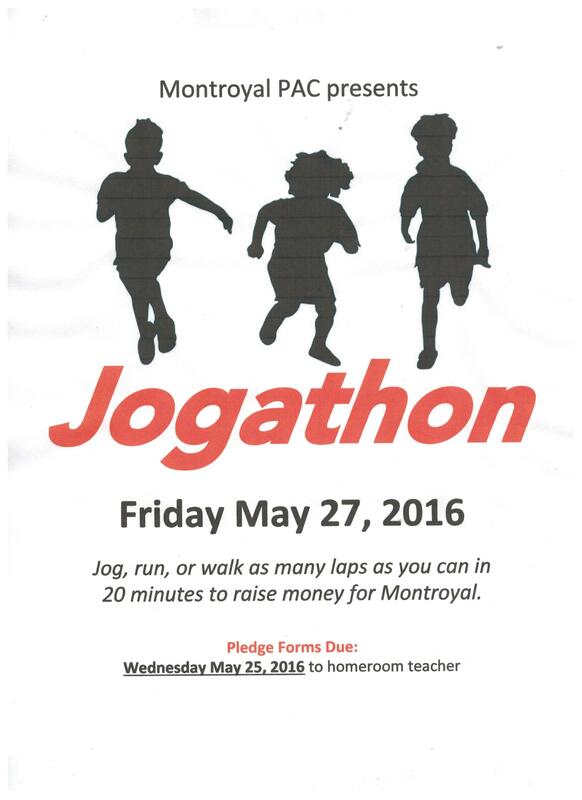 Come out and CHEER for your child this Friday, May 27th as MPAC brings back the popular JOG-A-THON! Schedule of the day follows in order for you to plan your optional attendance. We will be looking for cheerleaders to also help with marshalling and lap-tracking. If your child has NOT returned their PLEDGE FORM, please ensure that it does get sent back to your homeroom teacher before Friday. We need these to track laps and then the forms will be sent home on Friday again for pledge collection. Note each division gets 20 minutes to run, please arrive approx. 5 minutes before your posted start time to allow for enough time to walk up to the field.